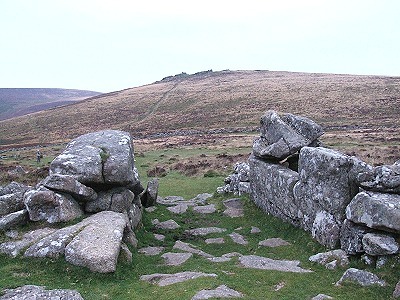 Grimspound is probably the most well known archaeological site on Dartmoor, partly due to its size but also because of its relatively easy accessibility, a short distance uphill from Firth Bridge on a minor road on the eastern side of the moor. It consists of a large outer pound wall that forms an irregular flattened circle measuring about 150 metres across at its widest point. This wall which now appears as a solid course of stonework is thought to have been constructed as an inner and outer pair of walls with a 1 metre gap between them with the whole structure measuring over three and a half metres from front to back and over a 1.5 metres tall. The collapse of this wall has obviously reduced the height and filled in the intervening space. Towards the south east is the original entrance, a 2 metre wide gap with large granite block facings and a paved area with steps that lead down into the interior area which is at a slightly lower level. Entrances to the east and west are thought to be more recent adaptations. Passing through the pound inside of the northern wall is the Grimslake stream and it would seem obvious that the site builders deliberately chose to include this source of fresh water within the area of the pound. 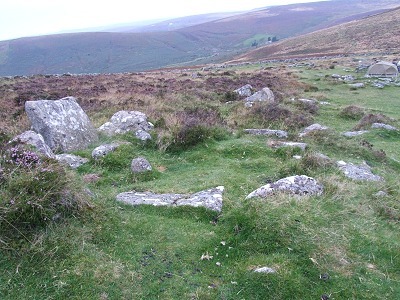 Dotted around the inside of Grimspound are the remains of 24 huts, but we must be careful of taking them at face value. 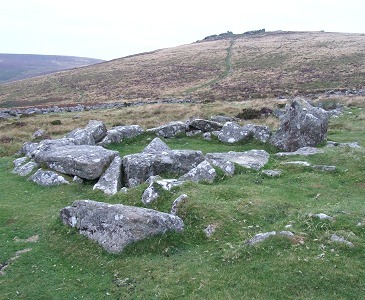 The site was excavated and partially reconstructed at the end of the 19th century by the Dartmoor Exploration Committee and some of their reconstructions, particularly one prominent hut towards the centre, are dubious and are likely to be their interpretation of what they thought the site may have looked like rather than being based on the evidence in front of them. That being said, we are grateful for their discoveries within the huts of hearths, porches, doorways, anvil stones, cooking stones, flints and pottery. The huts measure between 2 metres and 5 metres in diameter and most are circular although some are more oval. It could be that the large huts were for living with the smaller being used for storage. 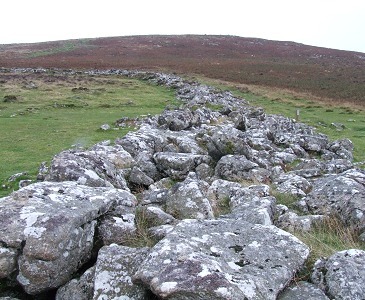 Towards the western side of the wall are several areas that are divided off by low stone and rubble walls that could have originally been paddocks or cultivation plots. Grimspound stands on a gently sloping saddle of land between Hookney Tor to the north and Hameldown Tor to the south, immediately to the west the land starts to fall more rapidly down towards a north south valley above which the modern road now runs. There seem to be few barrows and cairns in the immediate area which begs the question, if this was a settlement site, where did they dispose of the dead? The original entrance can be seen as the in-turned area of stone through the wall to the southeast while more recent entrances and paths pass through the eastern side of the wall and also to the southwest. The southwest entrance opens into a small area of stone walls interpreted as paddocks and is also close to some of the better preserved or reconstructed huts.